If you follow me on IG, you probably saw that I was attempting to organize my jewelry drawer yesterday. Talk about a hot mess check-in. I almost pulled the trigger on a necklace stand this afternoon to help with the situation but I think I’d rather keep my jewelry tucked away… (I hate the look of clutter). Anyway — my organization spree prompted the idea for this simple post. It seems like all I own and wear these days is gold jewelry. Occasionally, I will break out my silver or have fun with mixing metals but I primarily wear dainty gold necklaces, stud earrings, stacked rings, etc. 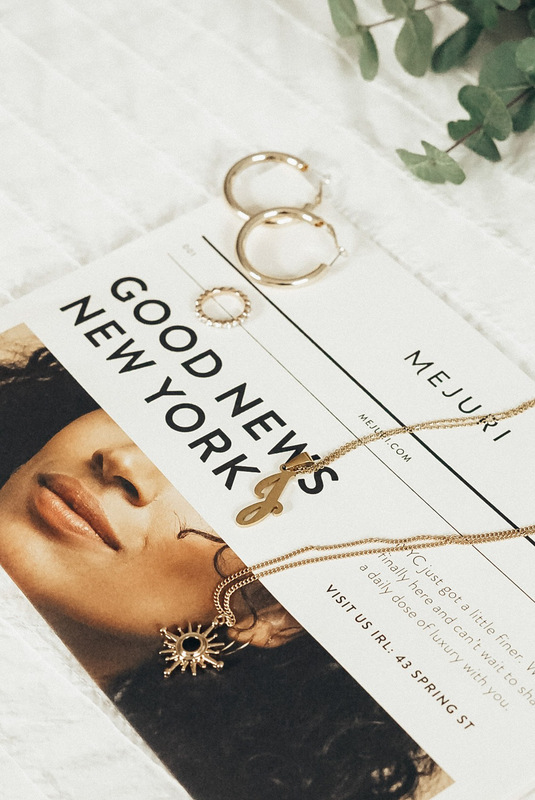 I had a reader message me about the J necklace that I got off Amazon recently so I figured I’d put up a full blog post on my favorite pieces of gold jewelry. Do note that I definitely don’t like to invest in nice jewelry because I am extremely notorious for losing it. Josh is constantly picking up midi rings from the carpet. LOL. Some of my favorite places to shop for jewelry are honestly Forever 21, ASOS, and Nordstrom.